I found my new favorite seasonal beer today... sorry Strawberry Abita. 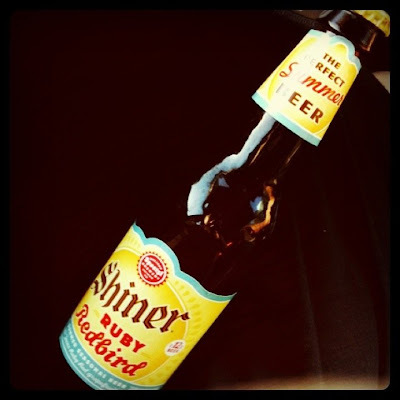 It's made with Texas Rio red grapefruit & ginger. I have a picture of me and my dad in front of the Shiner Brewery when I was only 6 months old. So maybe there was some type of subliminal thing going on that influenced my developing brain into loving Shiner products...once I turned 21, of course. Apparently these are hard to keep on the shelves, so our mission today was to stock up. We ended up finding a store with an impressive selection of beer...and cleaned house. We also found some Dogfish Head 90 Minute IPA and Raison D'Etre!